For the sixth annual Dog Show, "A Fetching Display of Canine Imagery," over 15 artists honored man's best friend with their artistic depiction of canines on Friday evening at Sisters Art Works. "The concept for The Dog Show is that it's cross-generational. This year we have young artists displaying their work from Sisters Middle School," said Sisters artist and show organizer, Kathy Deggendorfer. "We have an eclectic group of talented artists here tonight, from exceptional needle-felting to a decorated chair called 'Dog Eared.'" One of the featured artists, Shannon Pfifer, lives on Kenleigh Acres Farm in the Willamette Valley near Eugene, and raises Jacob sheep, using their wool to create felt pups. "I have been raising sheep for 11 years and never really did anything constructive with the wool. I dabbled in knitting, weaving and spinning but nothing struck a chord for me, and then a couple of years ago I went to a fiber show and found out about needle-felting. I learned how to needle-felt from a book, and decided to felt miniature dog figures. I started the felt pups in 2012; they are a combination of my love for dogs and my love for felting. We have five dogs along with 45 sheep, so I started with replicas of my own pups," Pfifer said. "Each one is made with 100 percent Jacob wool and is needle-felted." Pfifer's six felted pups on stands, displayed in the show, were for sale. Furry Friends Foundation had a table set up inside Sisters Art Works, handing out doggie-treat bags and selling raffle tickets for a dog-themed quilt donated by quilter Valerie Fercho-Tillery along with the new 2015 Furry Friends Calendar, the proceeds of which benefit Furry Friends Foundation. Abi Manley, a Sisters Middle School student, was one of artist Carolyn Platt's featured art students. She talked about her paper maché sculpture called "Playful Pup" at the reception with her mom, Kimberly. "I picked out recycled material from a bin and used pieces of yarn and scraps of fabric that I found," said Manley. Another featured artist, Karen Bandy, has been involved in art since her Portland childhood. After graduating from University of Oregon with an art education and then teaching art in Eugene, she returned to Portland to start her career in jewelry design and manufacture. She has had a successful design studio/store in Bend for over 30 years. "I started painting with acrylic about nine years ago, and decided to paint my dog Penny, a Corgi, a while back. I use acrylic on a masonite board then apply a UV glaze/varnish on top," Bandy said. Bandy had two paintings on display, called "Trickster" and "Penny," both for sale. One of Mary Medrano's favorite things to paint is dogs, and lots of folks recognized her acrylic painting, "Maggie," from last year's show on this year's poster. 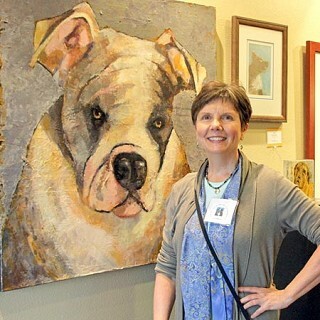 This is her third year back at Sisters Art Works with a new dog portrait featured. "This year's acrylic painting, called 'Teddy Bear,' was originally a six-by-six-inch painting that I did for a show in California, and decided to go large for this show," she said. Medrano specializes in pet portraits done in acrylics on panels. Her portraits feature friends' dogs, and they capture the spirit of the furry friends. Artist Kathy Deggendorfer also had works on display in the gallery during the dog days of summer, and one of her most recent paintings had a story behind it. "I was at the Old Mill District and watched two guys stroll over the bridge with their playful dog, and it just stuck with me," said Deggendorfer. "The painting is called 'Old Mill Strollers'." A portion of the proceeds benefits Furry Friends Foundation, which assists families in Sisters by providing a pet-food bank, help with veterinary care, and access to spay and neuter services. The Dog Show, A Fetching Display of Canine Imagery, runs through September 30, 2014 at Sisters Art Works, 204 W. Adams Ave.